Five years ago, when the local BMW club chapter requested to be the PVGP’s 2018 Marque of the Year they where determined to be the best marque ever. At the PVGP Victory Lap Celebration held fittingly atHofbräuhaus Pittsburgh, they learned they did just that. 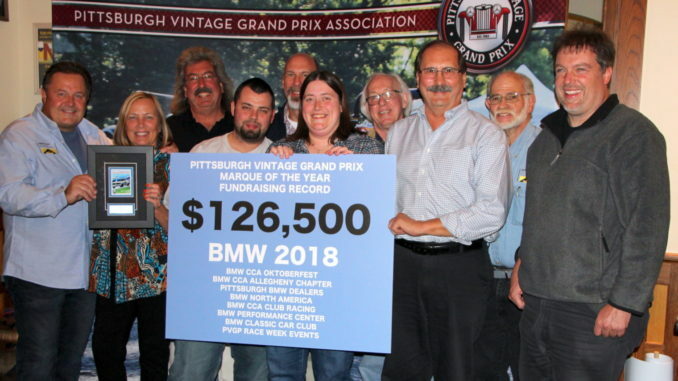 With the help of the BMW CCA bringing their national Oktoberfest event to Pittsburgh, over 750 show cars at Schenley Park, more than 110 BMW racers entered and the tireless efforts of the local Allegheny Chapter – a record $126,500 was raised!